I’m always sorry about something. Why do I feel apologetic for being part of a generation that had free uni education ? Why apologise for my luck in getting onto the housing ladder in my twenties? Why am I quiet about building up a good pension when others have to work for longer? Why am I reticent about taking a few holidays every year and spending three winter months abroad to get on with my writing? Why do I feel I’m partly to blame for being part of the Brexit generation that is spoiling our country’s future? I know I have had some lucky breaks but hang on! When I went to uni, I didn’t travel abroad or take a gap year. My uni digs were basic and we didn’t even have TV. I worked every holiday to pay off an overdraft. My starter home was furnished with family cast offs and the mortgage meant we didn’t take a holiday. I worked and brought up my daughter and holidays were few. As from today, I’m going to try my hardest to stop the apologies -especially that one where I say I’m JUST a women’s fiction writer. 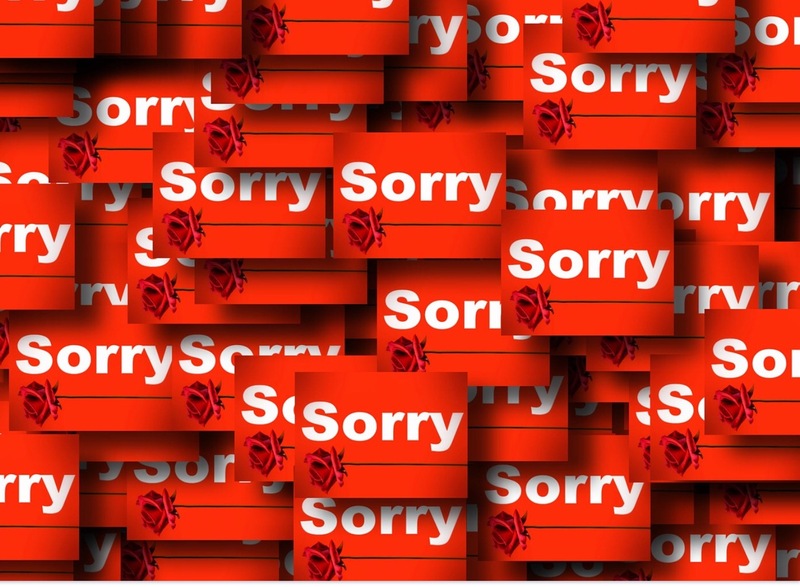 Does anyone else feel like they’re always about to say sorry? The funny thing is, many people who should be apologising about uni grants, housing, pensions and Brexit wouldn’t dream of saying sorry. Isn’t it strange how fiction can intermingle with our lives? I wonder if you have ever followed in the footsteps of a character you like? I have a great love of Egyptian history and decided that one of my characters in ‘A Jarful of Moondreams’ should make a trip there. I had visited most of the places I mentioned in the novel but I’d never been to Makadi Bay. That was chosen after Internet research for a beach location. My husband booked a December Nile cruise and Red Sea holiday for us and I thought the resort name seemed familiar but it wasn’t until we were travelling there that it dawned on me; I was following in Teri’s Moons footsteps and going to Makadi Bay! In ‘A Jarful of Moondreams’ Teri Moon decides to take an extended trip to Egypt and leave Alex, her teenage dughter, with her older daughter, Cleo, in the hope that they will stop sparring and start to like each other a little. The novel is mainly about Teri’s girls but her holiday adventures are a subplot. Teri meets Greg, an archaeologist, on the plane out to Cairo and they visit the pyramids and Cairo museum together before Teri continues alone on her travels to Mount Sinai. Teri decided to take a beach break at Hurghada before the trip to Luxor and all its wonders. She was going to meet up with Greg again to explore Luxor and the Valley of the Kings. She checked into a luxury hotel, enjoying the air conditioning and the chance to skype her girls. She had been delighted at how they both seemed to be comfortable in one another’s company. Even Pharos, her cat, seemed to be settled; perhaps her plan was working. Greg had surprised her. He’d asked if she’d mind him joining her on the beach and arrived at Makadi Bay a couple of days ago. They’d had fun and relaxed and were very easy in each other’s company. But now Teri felt rather confused. They’d held hands walking along the beach last night and she knew they were getting fond of one another. Maybe too fond? He’d told her he was forty, that was nine years her junior. Was it such a gap? That was the main thing stopping her from succumbing to a holiday romance. That, and the fact that Greg was the first man she’d looked at in that way since Mac. It must be the spell of Egypt. Greg’s shadow stood in the way of the sun. He dropped an ice-cold lolly on her midriff. ‘Greg!’ she shrieked. He sat on the end of her lounger. Tall, tanned, long hair ruffled by the sea, who could resist him? He was thoughtful and caring too. ‘What do you mean, a siesta?’ Teri sat up. She was lost for words. He’d placed the beach ball firmly on her patch of sand. So, this month, I’ve followed in the footsteps of two Neferteri’s and had a fabulous time in Egypt. It doesn’t have to be a place, though does it? You can follow in the life experiences of a character too. Don’t get me started on Bridgit Jones! I’m sure that, if you think about it, you’d have a few of those moments. I’d love to hear them. Bedouin children greeting us when we stop for a break. There is a baby goat riding on the donket too. They are sharing out a bag of crisps. Have you ever met one of your heroes? – I did! It’s not every day you get the chance to meet a hero or heroine in the flesh. One of my favourite writers and a writing role model for me is the wonderful Marian Keyes and, on a dark and rainy evening, I headed for the bright lights and warmth of our local Waterstone to meet her- actually hear her speak. It was lovely to mingle with other fans, have a glass of wine and and buy my copy of her latest book, ‘The Break’. We were all glad that she was generous enough to travel to the far North to chat to her readers in Newcastle. It’s a risky business, meeting some one you have admired for a long time. Would she live up to my expectations? You can all breathe a sigh of relief – she did not disappoint. Not one bit. She was as small and sparkly as I imagined and the Irish lilt was as strong as you hear on her vlogs and TV. She talked about everything, from nail ‘farnish’, to boots to Peppa pig sweets, as well as her new book and she was lovely. She even brought Himself along with her and other fans of Marian will know how important he is to Marian’s life. But Marian is more than all that lovely stuff I have mentioned. She also talks about the tough things in life like bereavement and depression and how young women can’t have abortions in Ireland because of the eight amendment of the Irish constitution. She stood up to this and became part of the ‘Artists’ Campaign to repeal the eighth amendment’. Marian Keyes picks her battles and this is a worthy one. Her new book ‘The Break’ touches on these topics and, during the evening, she didn’t shy away from any questions. Her new book also has a rather attractive Geordie (male) in it . Her Newcastle readers are in for a treat! I reviewed The Break for net galley and gave it 5 stars on Amazon but if there were 6 it would have got them. It’s a brilliant read. You can read a full review on my book review page. You’ll already see why she is a good role model for a new writer like me but my main reason for aspiring to be like her is her determination, she’s back on form after crippling depression, and her delightful unique voice. You know Marian’s work because of that Irish voice that tells a good tale and broaches the subjects we all worry ourselves about yet can still be laugh out loud funny at times.. I want to write books that allow readers to escape and laugh then cry with the characters. Isn’t that far easier to say than to do? I found that out when a wrote ‘A Jarful of Moondreams’. That’s why Marian is my role model and I’m so glad I met her. If Marian Keyes can recover from alcoholism, face up to depression, write wonderful novels and travel all around the country to meet her readers, she can be one of my role models for life not just for writing. I hope I’ve got you thinking about a special meeting with a hero that you’ve had or, if not, I hope I’ve tempted you to plan one. I’d love to hear who you admire and why. Can a certain song take you back to a time or place or bring back being with a special person? Music does that for me. That’s why I am pleased to be part of a music blog event organised by Elaina James. You can read about her journey into song writing on www.mslexia.co.uk/author/elainajames and on www.elainajames.co.uk. If you’re anything like me, you’ll listen to music in different ways. Way 1 -Listening to music using head phones to block out all other distractions, the instrumentals sound fantastic and the lyrics are so clear that it’s like being transported to another world. I love to do this under the shade of a beach umbrella and, if there is no beach, lying on my bed comes a close second. Way 2-Going to concerts and sharing the music with friends and other fans is a different experience. Who doesn’t get carried away by the atmosphere of a concert and a live performance? I remember most concerts quite vividly because of the thrill of getting the tickets and the anticipation of going as well as enjoying the event. Two of my favourite gigs have been David Bowie and Dolly Parton so I have eclectic taste. Way 3- When I’m active, I like music to spur me on. I have a few favourite running tracks and they can keep my spirits up when the weather is bad or the legs feel leaden. If I have to face the gym, there has to be music to distract me and I prefer a Zumba class to the treadmill. I use music to ease me into the writing zone too. I tend to play a few tracks when I’m using social media or sorting out my mail and before I start to write or at the very beginning of a writing session and then turn down when the writing gets going. Jean Paul Richter, the romantic writer, said, ‘Music is moonlight in the gloomy night of life.’ I like the idea of music acting as moonlight and, when I was writing the first draft of A JARFUL OF MOONDREAMS, I created a playlist around the moon motif within the novel. Both melody and lyrics are important to me and each song is a glimpse of how someone relates to the moon. I wonder which of my tracks you will recognise? My playlist starts with a 50s ballad and the unique voice of Sinatra singing ‘Blue moon,You knew just what I was there for,You heard me saying a prayer for,Someone I really could care for’. My novel takes place over five moon months and, yes there was that special blue moon in the July of 2015. The timeline of A JARFUL of MOONDREAMS takes us through the pink moon of May, a mead moon, a thunder moon a blue moon through to a September harvest moon. What no cherry moon? Prince’s rendering of Cherry moon had to be on my playlist. ‘How can I stand 2 stay where I am, Poor butterfly who don’t understand, Why can’t I fly away in a special sky, If I don’t find my destiny soon, I’ll die in your arms under the cherry moon.’ Sad news this month, won’t we all miss his extraordinary talent? So there you have the songs that lead me into my book. I think that writing and music go together but aren’t all aspects of life enhanced by music? How do debut authors get published? My 2016 new year plans for publishing ‘A Jarful of Moondreams’ have changed. It’s usual for me to let my resolutions slow to a crawl or fall by the wayside (What dry January? Who said diet?). I’ve surprised myself by increasing the challenge and moving forward on this year’s resolution much more quickly than I intended. Those of you who read January’s blog may recall that I was going to send submissions to agents for several months and wait to see if someone would represent me before turning, as my last resort, to self publishing. A good plan, I thought. Sending off three or four submissions per month was taking up a day or two of writing time and then there was the waiting for an answer, or no answer to deal with. It took up more thinking space than I thought it would and each month it was hard to settle into writing book two. In January, submitting was a new task. In February it was a chore that had to be done if I wanted to be published. By March, the rejections started coming in; I received three very thoughtful rejection emails. 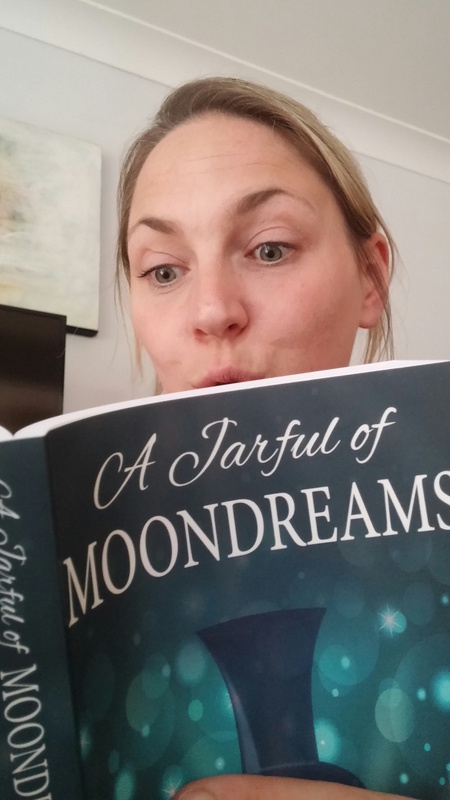 ‘A Jarful of Moondreams’ wasn’t for these agents but they wished me luck. I had been prepared for rejection but the ‘not hearing’ from agents is hard even though I know they’re really busy people. So, with my March submissions being even more of a grind, I decided to give the submissions a rest for a month or so and just get on with book two. I didn’t want to call a halt to getting my book out there but I had submitted to eight agents and, if they didn’t want it, who would? I enjoyed becoming immersed in writing my new novel but, without looking for the topic, I kept reading about self publishing in news articles, on twitter and on Facebook. A couple of my own previous examples are – I kept seeing people with terrier pups when I was in a position to have a dog at last and it had been a long awaited goal. I kept reading about authors who were in the RNA new writers’ scheme when I felt like I wanted writing support but wasn’t sure where to find it. Once I had my pup and once I was on the RNA new writers’ scheme, those pups and writers were still about but they didn’t register in my RAS with as noisy a ‘ding’ every day because I had achieved those things. I decided that, if my RAS was flagging up self publishing and I was less enthusiastic about sending submissions, I had the answer to rethinking my plan. It was an article by Rachel Abbott- don’t you love her thrillers?- about her route to self publishing that first got me thinking. Rachel’s novels are best sellers but she couldn’t find an agent. Her success has been phenomenal and she got her agent. Lizzy Kremer represents Rachel now but she still self publishes . A Facebook friend sang the praises of Matador, part of Troubadour publishing, who supported her self publishing journey. Accent press advertised their new venture in the self publishing market. Well established publishers are collaborating with authors who want to self publish. Why not give it a try? I had to discuss financing this plan with the other half of the team and, straight away, he said, ‘Yes, do it.’ Readers, if you’re out there, (I had already married him) I did it. Gulp, big decision made. I sent my novel to the two reputable publishers that I’d heard of and both gave me a good choice of levels of publishing and marketing. I decided to go with Octavo ( part of Accent press) who were offering a discount to RNA members and, now the decision is made, I’m delighted to be starting on this exhilarating journey. My book, ‘A Jarful of Moondreams’, will definitely be available worldwide as an ebook and as a paperback this year. How exciting is that? Was my decision too hasty or would you have done the same as me? Has your RAS ever gone into overdrive about a goal? I’d love to hear your views. I’ve got it in writing – Dday is here. I have a duvet day marked in my diary for today. On a typical Dday I’ll get up, make breakfast and take it back to my duvet along with the papers, my iPad and my laptop. Duvet days can be very productive. Look at today, I’m writing my blog at 9.30. It is Sunday so I have already had scrambled eggs, browsed the headlines and made a start on my blog in the first hour of duvet habitation. Soon, I’ll need a nap. I only have this sort of day if I am ‘slightly’ ill or recovering from something. Few and far between means that Ddays are appreciated. Why on a Sunday when everyone relaxes anyway? Because tomorrow I have a minor hospital procedure and I need to prepare. OK, if you’re curious, it’s a colonoscopy. I have one every couple of years and it means that I need to have a clear colon so, after breakfast, no food for the rest of the day and at lunchtime a drink that ensures my colon is squeaky clean. Although I need to rest and be near the loo, today will be very productive! I’ll write a few pages of book two. My WIP is going along really well so I may write more pages than a few but I’ll make sure that I stop in time to watch a film, not chosen yet, and to finish off ‘We are all made of Stars’, my current read, by Rowan Coleman. Why can’t I join you? I may even have some company in the afternoon but I won’t be the one getting out the cake and coffee because it’s too tempting. Mr CB will be host and will also be catering for himself today. He has volunteered to dog walk this afternoon too. So, excuse me, it’s time for a hot drink and a flick through the Sunday supplements. I must read Liz Jones’ diary to find out if she is a happy bunny this week. I live in hope that one day she allows herself to enjoy life. Tonight, I might just go through my own diary and mark in a new Dday that I can look forward to. I first heard this in John Lennon’s song, ‘Beautiful Boy’ and John’s fate is my reminder to appreciate each day as it comes whether your plans work out or not. We do thrive on plans that take us forward though, and I’m happy that my writing plans for 2016 are forging ahead. I’ve completed my final draft of ‘A Jarful of Moondreams’ and , each month, I’m sending it off to two agents and a publisher. I figured that this means I’ll always have one of two people considering my work and won’t have all my rejections back at once. Talking of rejections, I’ve just had my first. It was a nicely worded rejection and I’ve been told so often that I’ll get lots on my journey to publication that it was a sort of right of passage. Opened it, read it, over it. As well as looking for representation, I’m looking into self-publishing. My plan is to be published one way or another and, while I would be delighted to be taken on by an agent who loves my work, I’m prepared to go it alone. I’ve loved writing for the past couple of years but now I’m learning how satisfying it is for my novel to have readers. I know I’m going to have great fun when I’m taking it out into a wider field and promoting it. While the first born is getting out there, novel 2 has not got a title. There are several that I like but I don’t want to pin it down yet. With number 2, it’s easier to make writing time, to allow the characters to develop as they come to life on the page and to allow the odd new twist to appear in the story. There’s a welsh terrier who wants to make an appearance. He’s a lovely character like my welshie , Oscar, but older and wiser. I’m enjoying drafting this story because I’m getting rid of the ‘this is rubbish’ voice that used to crop up when I first started writing. If it whispers that it’s rubbish, I say that I can always go back and change it. I’ve written right up to THE END once so I can do it again because I’m a writer.